Lothians player Kieran Cantley, pictured, is sharing 16th place after two rounds of the South American men's amateur golf championship at Santiago, Chile. 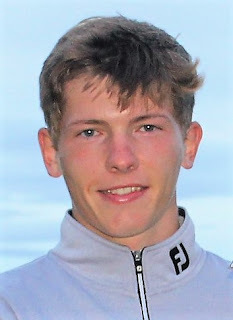 Last year's Craigmillar Park Open winner has had two par rounds of 72 for 144 - six behind the halfway leader, Mateo Fernandez de Oliveira (Argentina) who has scored 65-73 for six-under 138, a shot ahead of Chile's Gabriel Morgan (73-66). Euan Walker is T32 on 147 after rounds of 74 and 73.